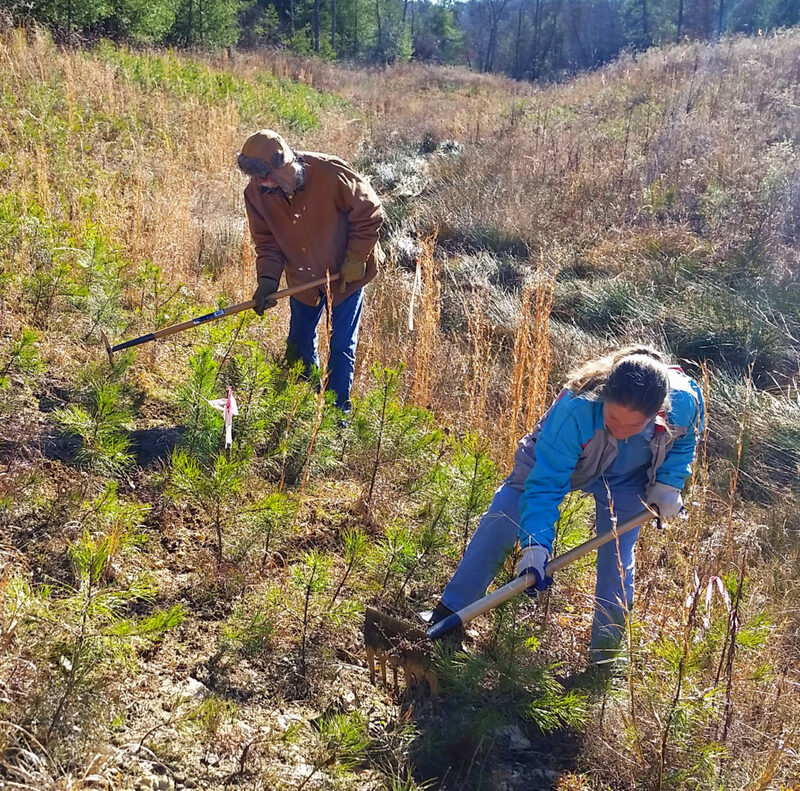 We began restoration of streams on our Community Farm in 2013, to improve water quality in the French Broad River watershed. Heavy logging and agricultural use within the stream areas in the early 1900s caused soil on stream banks to become unstable and erode away. This erosion filled the streams with sediment and caused the banks to become steep and vertical, in places choked with thick vine growth from invasive plant species. Excess amounts of sediment in the water harms stream health as well as animals that depend on it – such as frogs, turtles, snakes, insects, and fish. In fact, sedimentation is the #1 water pollutant in our region. 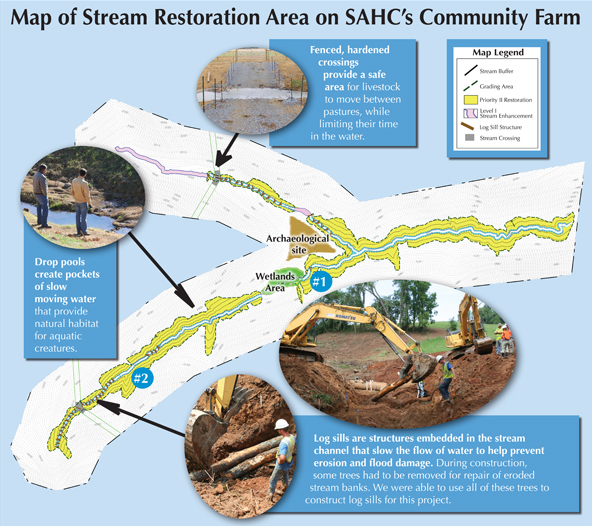 During our stream restoration project, we repaired the eroded stream channel and stream banks, installed log and rock structures to regulate the flow of water, and constructed pools for stream creatures to thrive. 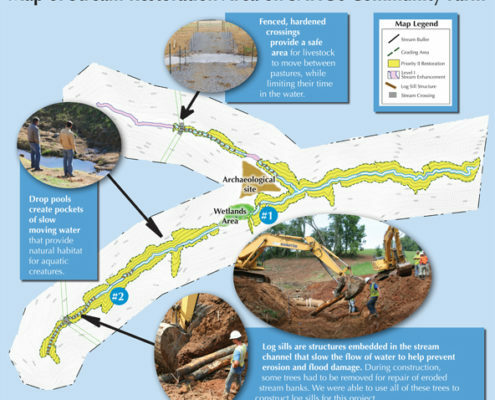 We restored over 3,000 linear feet of streams flowing into Newfound Creek in the French Broad River watershed. 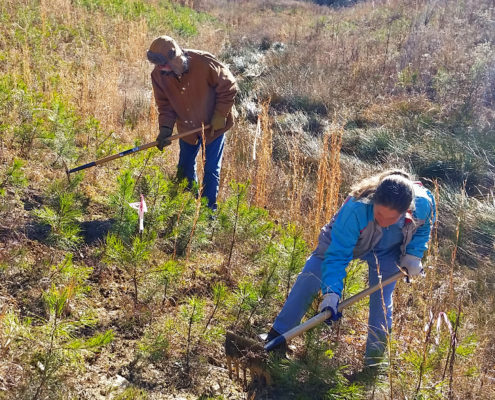 We created a 150 ft. buffer that extends on either side of the stream channel (300 ft/25 acres total), and planted over 25,000 native trees and shrubs. These plantings in the buffer area will produce deep root structures to help prevent future erosion issues. The buffer zone will also provide habitat for native animals. During the course of survey and design planning for the project, we discovered 19th century farm artifacts and an intact wetland habitat area along the stream corridor. Both of these areas were protected during the construction process and can be viewed from our new Discovery Trail. Following agricultural best management practices, we installed infrastructure, including hardened crossings and off-stream watering tanks, so that the land can continue to be grazed as a working farm while protecting stream and habitat health. We’d like to give special thanks to the Pigeon River Fund and private philanthropic leaders for making this project possible.